· Victorias Riflebird is one of 12 bird species endemic to the Wet Tropics region. · It is one of four birds-of-paradise indigenous to Australia. woodpecker, it often searches bark or decaying wood with its long arched bill. 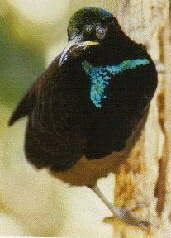 · Victorias Riflebird is known as duwuduwu to the local Bama (Aboriginal) people. throughout the year. It is named after the British Queen Victoria. head, throat and tail that sparkle in the suns rays. The female is a red-brown. upstretched head and neck, swaying from side to side and bobbing up and down. their bill, their brilliant yellow mouth interior can be seen. they regularly damage cultivated fruit. have a swift and direct flight. · Riflebirds are numerous round Chambers Wildlife Rainforest Lodge .